BACKGROUND: Recent reports reinforce the widespread interest in complementary and alternative medicine (CAM), not only among military personnel with combat-related disorders, but also among providers who are pressed to respond to patient demand for these therapies. However, an understanding of utilization of CAM therapies in this population is lacking. OBJECTIVE: The goals of this study are to synthesize the content of self-report population surveys with information on use of CAM in military and veteran populations, assess gaps in knowledge, and suggest ways to address current limitations. RESEARCH DESIGN: The research team conducted a literature review of population surveys to identify CAM definitions, whether military status was queried, the medical and psychological conditions queried, and each specific CAM question. Utilization estimates specific to military/veterans were summarized and limitations to knowledge was classified. RESULTS: Seven surveys of CAM utilization were conducted with military/veteran groups. In addition, 7 household surveys queried military status, although there was no military/veteran subgroup analysis. Definition of CAM varied widely limiting cross-survey analysis. Among active duty and Reserve military, CAM use ranged between 37% and 46%. Survey estimates do not specify CAM use that is associated with a medical or behavioral health condition. CONCLUSIONS: Comparisons between surveys are hampered due to variation in methodologies. Too little is known about reasons for using CAM and conditions for which it is used. Additional information could be drawn from current surveys with additional subgroup analysis, and future surveys of CAM should include military status variable. There is a growing interest in complementary and alternative medicine (CAM) use in general including among veterans and military personnel. CAM use is growing, in part to alleviate physical and psychological disorders and to increase wellness. [1, 2] Adding to our knowledge about effectiveness of CAM, a number of reports by the Veterans Administration (VA) and the Department of Defense (DoD) have reviewed the research evidence for CAM related to specific psychological conditions including post-traumatic stress disorder (PTSD), [3, 4] depression, and anxiety,  and as part of a broad review on the evidence for mind-body practices. These reports reinforce the widespread interest in CAM among military personnel and veterans dealing with combat-related psychological disorders. Despite this interest, the extent of CAM use among military personnel and veterans is not well documented. Although practitioner surveys within military and VA health systems were recently completed,  many CAM therapies are not monitored because they are not practitioner based (eg, herbal treatments). Even CAM that is administered by practitioners may not generate insurance claims thereby limiting independent sources of data for analysis. One recent study found that when CAM was provided in the VA, a procedure code was assigned only 40% of the time. Because therapies, such as massage or high-dose megavitamins, are not typically included in covered benefits,  the majority of CAM use is possibly independent of the military health system and the VA and therefore outside claims data analysis. Hence, obtaining generalizable estimates of the extent of CAM utilization in both military and civilian populations is dependent on selfreport from population surveys. CAM use is driven by several factors. As with the general public, use is partly driven by lack of access to adequate specialty mental health treatment and to stigma associated with psychiatric conditions. [9, 10] Veterans who seek professional care often find their symptoms may not be alleviated by more traditional behavioral therapies. Among the military, rates of PTSD and chronic pain are high [12-14] and the chronic nature of these conditions leads many to explore CAM as adjuncts to conventional treatment [15-17]. Given that a recent study found that military personnel use CAM 2.5–7 times more frequently than civilians,  more reliable and efficient means of assessing their use among military personnel through population surveys is important for practitioners and for health services researchers. The study of CAM utilization using survey methodology presents 3 major challenges. First, investigations differ regarding the definition or scope of CAM, especially when a broad rubric is applied, and it can be difficult to classify which treatments have moved from “alternative” to “mainstream” categories. [18, 19] Even if investigators agree on a CAM list, it is unwieldy to include all in a single survey. Secondly, the purpose of CAM use is frequently not knowable. Determining whether CAM use constitutes treatment for a specific health condition can be difficult to assess, especially in cases when CAM is delivered by providers outside of organized or licensed medical settings (eg, massage). CAM may be used for preventive and restorative purposes, [19, 20] as stand-alone conventional treatment, as an alternative to conventional treatment, or to complement conventional treatment. Lastly, defining and understanding dose is challenging. For example, many herbal treatments are not regulated and strength of an active ingredient may not be labeled. Military personnel/veterans are a heterogenous group, encompassing active duty, reserve, National Guard, retirees, and veterans from peacetime and wartime eras. Definitional issues exist even in surveys of military members and veterans. Because of the differences in the way military and veterans are defined both within and outside formal military establishments, it is challenging to specify the analytic group. For example, combat veterans can include current military, only those separated from service, or restricted to those entitled to VA benefits. Second, timing of survey is critical as responses may vary due to war experience  especially with regard to psychological conditions. Veterans who served in combat in Iraq are likely to have different needs and conditions than veterans who were not deployed. Surveys generally do not query these 2 important measures regarding military experience. Because of the growth in utilization of CAM therapies, the Military Operational Medicine Research Program of the US Army Medical Research and Material Command (USMRMC) requested an analysis on CAM and its use for treatment of PTSD in military personnel. The current study, presents findings from the synthesis of CAM utilization estimates prepared for the USMRMC project. The present study was conceived as a gap analysis through synthesis of literature regarding CAM utilization among military personnel and veterans. The aims of this paper are 3-fold: (1) describe population and self-report surveys that provide estimates on CAM utilization; (2) identify among these surveys the CAM therapies utilized in the military population; and (3) identify areas for future investigation through an analysis of questions asked on surveys, especially ones that query psychological conditions and reasons for use. The literature provides analysis of civilian population surveys that focus on CAM,  but none to date have been done of military surveys. With a focus on the military, this analysis will add to our knowledge of CAM use as well as document gaps in research and limitations of current survey designs. To accomplish these aims, a research team conducted a literature search to identify population surveys. We extracted content on relevant topics, and assessed gaps in the information reported and available on CAM use among military personnel and veterans. Survey analysis was approved by Abt Associates Internal Review Board, Cambridge, MA. Three team members conducted independent online search for household survey databases. First, we searched abstracts in electronic databases for the literature that reported estimates on CAM utilization from population-based, general household, or military self-report surveys (Figure 1). The electronic databases PubMed, CINAHL, Embase, Psycinfo, Pilots, Embase, Google scholar, and The Cochrane Library were accessed to identify appropriate articles, as described in original study report. Searches were conducted between January and June 2012 and updated on January 2014. No time frame was imposed on survey administration. Keywords included: “CAM,” “complementary medicine,” “alternative medicine,” “household survey,” “population survey,” and “probability survey.” We also searched selected Web sites to discover articles and reports that did not result in peer review publications, including DoD, Military and Veterans Health Administration, World Health Organization, and National Center of Health Statistics. Abstracts and reports were included if the survey was population based (or used random selection of military respondents) and queried at least 1 CAM. We utilized the National Center for Complementary and Alternative Medicine’s classification of CAM  for inclusion criteria. CAM therapies are classified into: (1) biologically based practices, (2) mind/ body practices, (3) manipulative and body-based practices, (4) energy-based interventions, and (5) whole medical systems. Some private surveys could not be included as the results are proprietary and perceived to be less relevant to our purposes. Survey instruments were located from survey sponsors documentation when available, or from the authors’ description. To facilitate analysis, we created a data collection instrument for extracting information from the retrieved survey documentation and publications. If CAM questions were administered in multiple years, we abstracted information from the most recent survey. Elements extracted included survey year, sponsor, study design, population sampled, specific CAM questions, variables that define military/veteran status, and main CAM results. Estimates on CAM utilization were taken from peer-reviewed literature, or in some cases, the sponsoring Web site if data were not published. Team members reviewed all documentation manuals, read main reports and publications, and consulted study’s Web site. A third team member reviewed survey information to ensure its completeness and clarity. For analytic purposes we divided surveys with CAM items into 3 tiers (Table 1). Tier 1 was defined as surveys of military-related populations or patients including military members, their dependents, and/or veterans. Tier 2 was defined as surveys that queried general household members or patients and included a question to identify the respondent’s military or veteran status. Tier 3 was defined as surveys of general household members or patients without a question on veteran or military status. The main comparisons presented here are between surveys in tiers 1 and 2. To compare and summarize data we developed 3 tables. Table 1 provides surveys identified in all 3 tiers. For brevity, we attached initials to identify each survey. It should be noted that even though many of the third tier surveys are widely used to report CAM use, we did not include them in our other analyses because they could not provide information regarding military-related use. 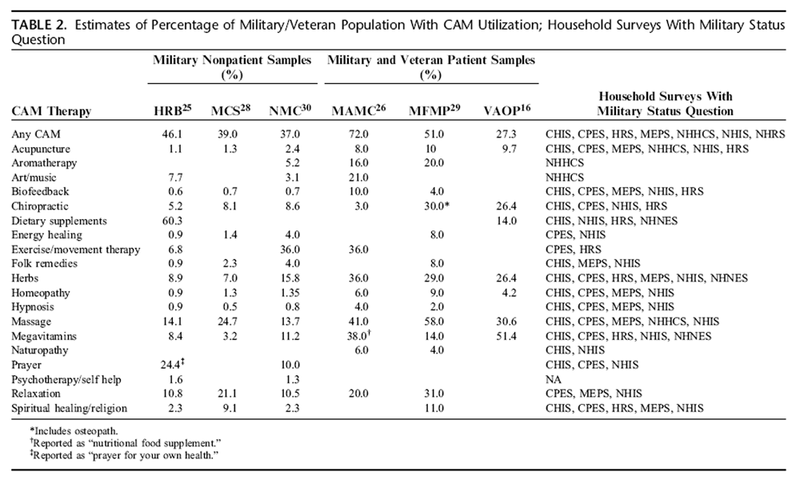 Table 2 compares the percentage of military/veterans who used CAM during a prior 12-month period. For this table, we created patient and nonpatient respondent subgroups. For gap analysis we included a list of tier 2 household surveys that could offer additional military-related data through subpopulation analysis. Table 3 presents self-report behavioral health conditions queried on tier 1 and tier 2 surveys. The most recent military-related (tier 1) data were collected in 2005, compared with 2012 and 2013 in other household surveys. Five surveys included CAM questions only in a supplement rather than the core, including 1 military survey, 2 civilian surveys, and 2 in tier 3. Across all tier 1 and tier 2 surveys, a total of 49 different CAMs were queried. The most common CAMs queried in tier 1 surveys were acupuncture, chiropractic care, massage, megavitamin, herbal, and homeopathy. Among tier 2 surveys, the most common CAMs queried were acupuncture, megavitamins, and herbal therapy. For reasons mentioned previously (lack of consistent definition of CAM and specific populations studied), the surveys report a wide range of utilization rates, with highest use generally among patient population. Overall, any CAM use ranges between 37% and 46% among nonpatient and between 27% and 72% among patient samples. The lowest estimate sampled a predominately male population that is less likely to use CAM. MAMC included retirees in its sample that may account for the higher utilization. Concurrent with other research, CAM estimates are higher in populations sampled from western region of the United States (MAMC and MFMP). Although it is likely that surveys that query more CAM therapies will report a higher percentage of “any CAM,” this table indicates otherwise. Specifically, among active duty respondents, HRB queries 20 CAM yet reports lower utilization than MCS with 12 CAM options. Among nonpatient populations, the most common CAM used were: dietary supplements, exercise therapy, massage, prayer, and relaxation. Among the patient populations the most widely used CAM were: aromatherapy, art/ music, chiropractic, herbs, massage, megavitamins, movement therapy, and relaxation. There was more consistency across surveys in the least widely used CAM with <11% using acupuncture, biofeedback, energy healing, folk remedies, homeopathy, hypnosis, naturopathy, and spiritual healing. Additional comparative estimates could be done with surveys listed in last column, especially CPES and NHIS that query most of the estimates published to date. Table 3 summarizes behavioral health conditions queried in tiers 1 and 2 surveys. Although exact wording of behavioral health syndromes varies slightly across tier 1 and tier 2 surveys, there were 11 different conditions queried. Four of 7 tier 1 and 6 of 7 tier 2 surveys queried at least 1 behavioral health condition. Estimates are not presented due to the different denominators used (either as a percentage of respondents with the condition who use CAM, or as a percentage of CAM users with the condition). This table indicates that HRB and MCS provide the most information on behavioral health conditions that affect a large percentage of military and veteran populations. Although analyses have been conducted on HRB questions related to psychological disorders, published studies have not included associated use of CAM. Likewise, CPES queries the most psychological conditions but subpopulation analysis of military or veteran groups have not been published. Generally, surveys do not query reasons for using CAM. 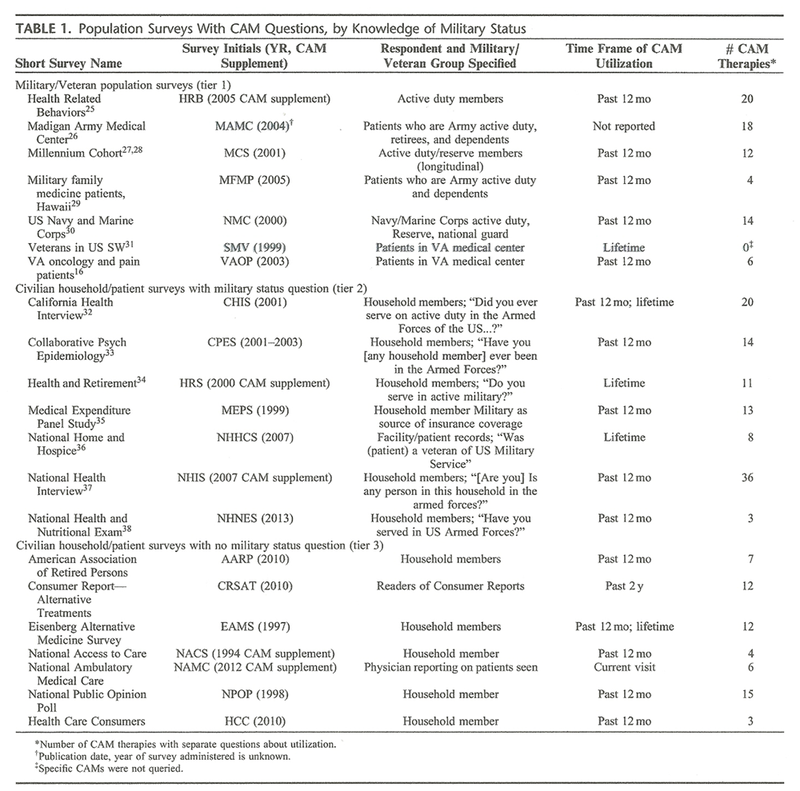 Of the total 25 surveys originally abstracted, 9 query reasons for CAM use, including 1 military clinic-based sample. Although the question varied in other surveys, a typical phrasing was, “During the past 12 months, did you use [therapy] for your own health or treatment of [condition]?” Some government health care surveys sponsored by the National Center for Health Statistics permit associating a respondent’s survey with Medicare records, provider visit records, or another specific facility records so ICD9-CM diagnosis codes may be obtained on conditions under treatment. However, none of those surveys ask respondent about their military status. 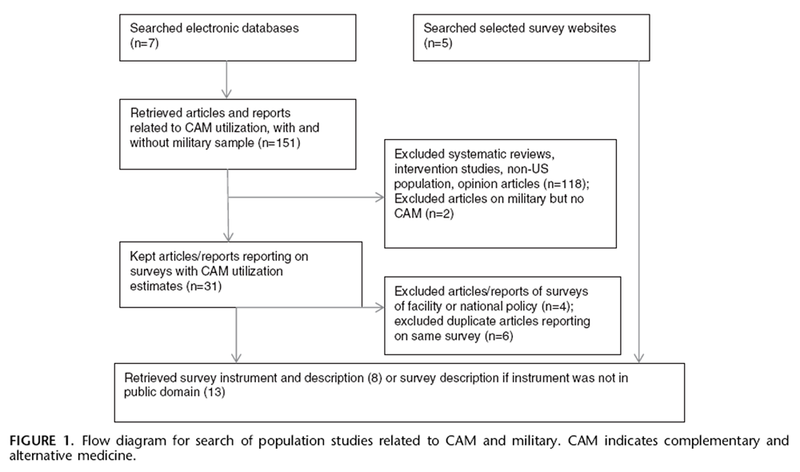 This paper reports on a review designed to describe population surveys that provide estimates of CAM use in the military, provide estimates of CAM therapies used, and identify areas for future investigation. The findings report that estimates may be outdated and CAM questions were frequently contained on a supplement only, limiting the opportunity for tracking changes in utilization over time. In addition, surveys lacked congruence of CAM terminology and inclusion criteria, thus, findings must be viewed within the context of differences in methodology and population sampled. Surveys also varied in definition of military and whether responses were analyzed for those with specific conditions or all respondents. Although difficult to study, the topic of CAM use among the military is important as consensus is growing in military and veterans’ health arenas that CAM interventions may have some utility as an adjunct treatment for psychological and other health conditions. [6, 40, 41] Multiple deployments among OEF/OIF warriors and the aging of Vietnam era veterans result in a growing prevalence of musculoskeletal, traumatic brain injury,  and psychological health conditions. In addition, rates of comorbidity across psychological health, pain, and brain injury are high. In short, we know these conditions are prevalent in military and veteran populations, but there are significant gaps in the data documenting the use of CAM to treat these conditions, implying the need for targeted studies. Studies of civilians indicate that CAM may be filling gaps in access to conventional treatment, especially among those with psychological conditions. In 1 analysis, 42.8% of visits of respondents classified as having need for mental health care were treated with CAM. In addition, adults are more likely to use CAM when the cost of conventional care is less affordable. Similar analysis across military populations would help VA and military health systems monitor the need for workforce training and programmatic planning. This review identified a number of challenges in understanding the use of CAM as currently documented in surveys. Few studies include the reason for CAM use, making it difficult to accurately assess the purpose that motivates CAM use. Motivation for CAM use among military personnel may be even more complex, for example, as part of a fitness regime,  to reduce stress, or to address symptoms of a specific psychological concern or health condition. In turn, respondents may not attribute CAM use to 1 symptom or problem even when asked. The findings from this analysis also identified several important gaps in our knowledge base. Some gaps could be remedied with incremental changes to survey questions, other gaps may require methods development, and other gaps could be addressed with additional analyses of extant data. Regarding incremental changes, surveys could include questions that distinguish military and veteran users of CAM by the condition for which they used CAM, hence making it easier to understand CAM use specifically in this population, especially for psychological conditions. Another gap identified is that active military may be excluded from many epidemiologic surveys. Information on veteran status is sometimes present, but not consistently; this includes deployed history, years of military service, and retirement status. It is important to note that military personnel and veterans living in households are part of the general population, and as such may be sampled in general population surveys but unidentified unless veteran status is queried. This valuable information could otherwise be used to effectively inform policy and practice in military/veterans’ health services planning. Questions about CAM obtained from surveys need further development to be more useful. It is difficult to summarize across epidemiologic studies as there are few common definitions of CAM and the lists of CAM therapies queried as “any CAM” rarely overlap. On the basis of review of existing studies, consensus should be reached on a gold standard for core questions to include in health surveys. The DoD and VA could promote discussions among key sponsors of such surveys to adopt a core list of CAM definitions. Recommendations could also be made that national surveys always include questions about CAM that are highly utilized. Surveys might also include standard questions about why the respondent uses CAM, in particular, whether a particular CAM is being used as a complement to or substitute for traditional treatment. Gathering this information is difficult in the context of a structured interview format, and methods development is necessary to collect more information about how a respondent uses CAM. Despite these shortcomings, there are worthy analyses that could be conducted through further disaggregation of general household studies (NHIS, CPES, and CHIS). In addition, linking survey responses of veterans and military personnel with health utilization encounters (eg, Millennium Cohort Study) provides detailed information on conditions being treated by conventional medicine with self-report of CAM usage. Moreover, there is value in methods development to analyze data from different surveys jointly so that statistical comparisons with covariate controls can assess differences in the prevalence of CAM usage among military, veterans, and civilians. Lastly, understanding how patients perceive CAM and currently use it for conditions for which they also receive conventional treatment is important information for medical practitioners. This may lead to better understanding of contraindications for CAM, including adverse interactions of CAM with traditional treatments. Therapies are often used by people completely on their own, and MDs cannot know about them unless they ask. At the very least, physicians need to be familiar with and to probe their patients on CAM that are most commonly used to treat specific ailments. Further analysis of these data beyond that already published and analyzed for this study could more completely inform the medical community on the medical and psychological conditions of CAM users. The authors would like to acknowledge the support of Institute of Behavioral Health, Heller School, Brandeis University and additional research help from Lauren Hajjar. Tindle HA, Davis RB, Phillips RS, et al. Altern Ther Health Med. 2005;11:42–49. Strauss JL, Coeytaux R, McDuffie J, et al. Efficacy of complementary and alternative therapies for posttraumatic stress disorder. Williams JW Jr, Gierisch JM, McDuffie J, et al. An overview of complementary and alternative medicine therapies for anxiety and depressive disorders: supplement to efficacy of complementary and alternative medicine therapies for posttraumatic stress disorder. Moore M, Brown D, Money N, et al. Defense Centers of Excellence for Psychological Health and Traumatic Brain Injury. Ezeji-Okoye SC, Kotar TM, Smeeding SJ, et al. State of care: complementary and alternative medicine in veterans health administration—2011 survey results. Goertz C, Marriott BP, Finch MD, et al. Bormann J, Thorp S, Wetherell J, et al. Meditation-based mantram intervention for veterans with posttraumatic stress disorder: a randomized trial. Shiner B, Bateman D, Young-Xu Y, et al. Comparing the stability of diagnosis in full vs. partial posttraumatic stress disorder. J Nerv Ment Dis. 2012;200:520–525. Goodson J, Helstrom A, Halpern JM, et al. Treatment of posttraumatic stress disorder in US combat veterans: a meta-analytic review. Mental health care needs among recent war veterans. New Engl J Med. 2005;352:1289–1289. Seal KH, Metzler TJ, Gima KS, et al. Trends and risk factors for mental health diagnoses among Iraq and Afghanistan veterans using department of veterans affairs health care, 2002-2008. Am J Public Health. 2009;99:1651–1658. Spelman JF, Hunt SC, Seal KH, et al. Post deployment care for returning combat veterans. J Gen Intern Med. 2012;27:1200–1209. Denneson LM, Corson K, Dobscha SK. McEachrane-Gross FP, Liebschutz JM, Berlowitz D.
Use of selected complementary and alternative medicine (CAM) treatments in veterans with cancer or chronic pain: a cross-sectional survey. BMC Complement Altern Med. 2006;6:34. Complementary and alternative treatments for PTSD. PTSD Research Quarterly, National Center for PTSD, 2012;23(2). Gaboury I, Boon H, Verhoef M, et al. Practitioners’ validation of framework of team-oriented practice models in integrative health care: a mixed methods study. BMC Health Serv Res. 2010;10:289. Koithan M, Verhoef M, Bell IR, et al. The process of whole person healing: “unstuckness” and beyond. J Altern Complement Med. 2007; 13:659–668. Otto LM, Howerter A, Bell IR, et al. Exploring measures of whole person wellness: integrative well-being and psychological flourishing. Barrett B, Marchand L, Scheder J, et al. Themes of holism, empowerment, access, and legitimacy define complementary, alternative, and integrative medicine in relation to conventional biomedicine. J Altern Complement Med. 2003;9:937–947. Schlenger W, Mauch D, Mulvaney-Day N, et al. Use of Complementary and Alternative Medicine in the Treatment of PTSD in Military and Veteran Populations in Behavioral Health Research Gap Analysis. Fort Detrick, MD: US Army Medical Research and Material Command; 2012. Surveys of complementary and alternative medicine: part I. General trends and demographic groups. J Altern Complement Med. 2001;7:195–208. Bray R, Hourani L, Olmsted K, et al. No. DAMD17-00-2-0057 by RTI International, 2006. Use of complementary and alternative therapies among active duty soldiers, military retirees, and family members at a military hospital. Jacobson IG, White MR, Smith TC, et al. Self-reported health symptoms and conditions among complementary and alternative medicine users in a large military cohort. White MR, Jacobson IG, Smith B, et al. Health care utilization among complementary and alternative medicine users in a large military cohort. BMC Complement Altern Med. 2011;11:27. Complementary and alternative medicine use among military family medicine patients in Hawaii. Smith TC, Ryan MA, Smith B, et al. BMC Complement Altern Med. 2007;7:16. Baldwin CM, Long K, Kroesen K, et al. A profile of military veterans in the southwestern United States who use complementary and alternative medicine: implications for integrated care. Goldstein MS BE, Ballard-Barbash R, Morgenstern H, et al. The use of complementary and alternative medicine among California adults with and without cancer. Evid Based Complement Altern Med. 2005;2:557–565. Libby DJ, Pilver CE, Desai R.
Complementary and alternative medicine use among individuals with posttraumatic stress disorder. Ness J, Cirillo DJ, Weir DR, et al. Use of complementary medicine in older Americans: results from the health and retirement study. Association between use of unconventional therapies and conventional medical services. Bercovitz A, Sengupta M, Jones A, et al. National Center for Health Statistics, Hyattsville, MD. Gahche J, Bailey R, Burt V.
Dietary Supplement use Among US Adults has Increased Since NHANES III (1988–1994). NCHS Data Brief, no 61 National Center for Health. Hyattsville, MD; 2011. Surveys of complementary and alternative medicine: part IV. Use of alternative and complementary therapies for rheumatologic and other diseases. J Altern Complement Med. 2001;7: 715–721. Schlenger W, Marmar C, Kulka R, et al. National Vietnam Veterans Longitudinal Study Final Report. Office of Research and Development; 2013. Gulf War and Health: Volume 7: Long-Term Consequences of Traumatic Brain Injury. Washington, DC: The National Academies Press; 2008. Seal K, Cohen G, Waldrop A, et al. Implications for screening, diagnosis and treatment. Druss B, Wang P, Sampson N, et al. Understanding mental health treatment in persons without mental diagnoses—results from the national comorbidity survey replication. On Total Force Fitness in War and Peace. In: Jonas W, O’Connor FG, Deuster P, et al. eds.